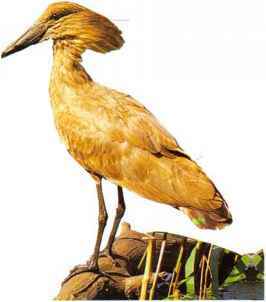 This large, storklike bird, recognized by its enormous, hook-tipped bill, occurs only in the freshwater swamps of east and central Africa. Shoebills live singly or in pairs, remaining most of the time in a small area of marshland. They sometimes feed in wet grassland or shallow water, but their favored hunting grounds are deep marshes and rivers or lakes choked with vegetation. When hunting, a Shoebill walks slowly and deliberately, often climbing over floating waterplants, spreading its weight on long, straight'toes. 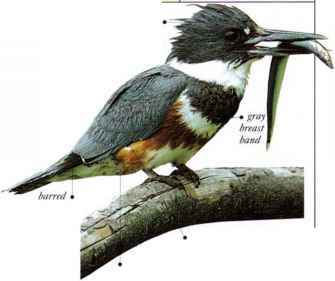 The bird pauses to watch the water for prey such as lungfish, catfish, frogs, water snakes, or small turtles. On sighting a victim, the Shoebill lunges forward and down, stretching its neck and whole body and spreading its wings. If it succeeds in making a catch, it usually also grabs a mass of waterweed together with the prey and has to separate out the food by turning it over in its bill. The flight of the Shoebill is slow but strong, with heavily beating wings and with the head resting back on the shoulders. The legs are extended behind. Shoebills are also seen circling and soaring on rising air currents to gain height. The species nests in isolated pairs among tall vegetation, usually over water. Parent birds are seen bringing water in their bills to pour over the small young in hot weather. 1 NEST A bulky platform of rushes, grasses, and leaves, in thick vegetation with the base usually in water. • DISTRIBUTION In African freshwater marshes from S. Sudan to Zambia and S.E. Zaire. This waterside bird is recognized by the hammerhead shape made by its bill and crest. It feeds in shallow water at the edges of rivers, lakes, and marshes, taking amphibians, small fish, and other aquatic creatures. It occurs in pairs or small family groups that tend to stay within a restricted area, but sometimes roam further afield during dry seasons. I Iamerkops fly with a mixture of flapping and gliding, their legs stretching out behind. The neck is drawn back when Happing and extended when gliding. • NliST A huge, oven-shaped mass of sticks with a small front entrance, lined with mud and placed in a tree or on a cliff, usually sited near or over water. • DISTRIBUTION Africa and Madagascar.